Aparna Constructions is a leading real estate developer in Hyderabad. Since 1996, Aparna has completed and delivered various projects comprising fully-integrated Gated Community Villas, Premium Apartments and Commercial Projects - spread over 15 million square feet. These projects are widely recognized for their path-breaking innovations, continuously surpassing industry standards and many of which have become Landmark communities. Aparna projects are developed with an unwavering vision to offer a sustainable balance between affordability and luxury with global standards of construction and environmental responsibility. Aparna Constructions wanted to develop a project with a new style of living that combines the perfect blend of modern architecture, amenities for leisure activities and outdoor entertaining. The client’s vision is to offer a sustainable balance between affordability and luxury while complying with global standards of construction and environmental responsibility. Developing luxury projects without compromising with sustainability, remains a major challenge both at development and operations stage. This project has implemented various energy conservation measures (ECMs) which has improved energy efficiency. The project team has adopted efficient roofing assembly and glass assembly to reduce the heat ingress into the building. The use of efficient light fixtures in the common areas, parking areas has achieved more than 30% LPD reduction over baseline. The energy generation from the renewable energy systems contributed to the energy consumption of the project. The installed solar PV system (140 kWh) caters to 2.5% of the net connected load (5565 kWh). The project has adopted energy saving measures –which include BEE 4 star rated pumps, BEE 4 star rated motors, group controls in Lifts and 1200 KVAR capacitor bank to improve power factor automatic water flow controller. To monitor and control the project performance various metering systems are installed. The project has installed energy meter for external lighting, municipal water pumping and Grey water pumping for flushing. 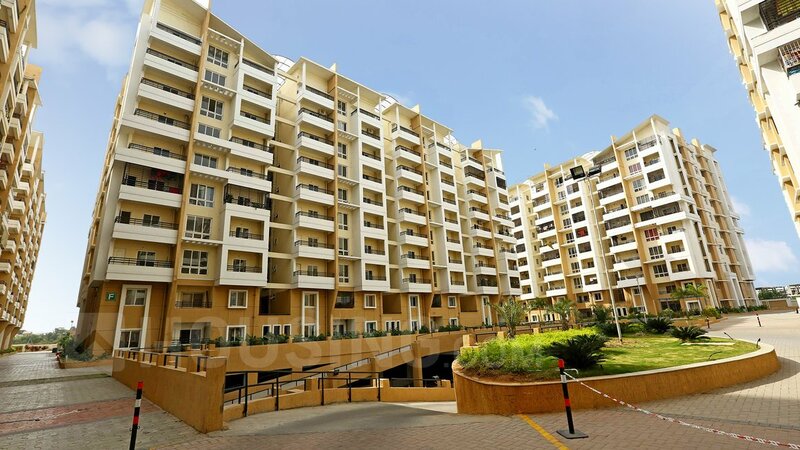 Aparna Sarovar Grande is designed such that at least 80% of the regularly occupied spaces in each dwelling unit have access to the outdoor environment in at least two orientations. 75% of the spaces achieve the minimum luminance level of 108 lux in all of the regularly occupied areas. The project has used rapidly renewable materials to minimize the usage of raw virgin wood. More than 75% rapidly renewable wood has been used in all the wood based materials in the project. The salvaged materials include used teak wood, china mosaic tiles, brick bat coba and Salvaged steel; and contribute to 1% of the total materials cost. Project has also diverted more than 95% of the construction waste generated on site through reusing or selling the recyclable materials to venders. More than 79% material locally (within 400 kms of construction site) to minimize the environmental impacts and carbon emissions due to transportation. The local materials sourced include cement, steel, glass, aluminium, tiles, bricks, sand and aggregate. This project has also used materials with more than 20 % recycled content of the total project cost. Bricks with fly ash, steel, PPC cement, window frames, Glass, tiles etc are used under this category. To reach the exemplary performance in water-efficiency 50% water use reduction over IGBC baseline was attempted. project has used low flow flush fixtures having flow rates of 3/6 and has installed low flow fixtures that include Kitchen sink, faucet (pillar/bib/Health) with 4 LPM flow rates and showerhead/ hand-held spray with 6 LPM flow rates. The project team achieves water saving of 50.4% over the baselines. In addition to the above water efficient measures, mechanisms of Rainwater harvesting has been installed which includes 2* 255 cu.m storage tanks and 33 percolation pits (3 Cu.m/day) around the periphery of the site. Waste management is a major challenge in the housing projects. To address this, provisions were made for 100% water recycling and 100% waste recycling. A sewage treatment plant having a capacity of 485 KLD installed to treat 100% of the waste water generated on-site. The estimated waste generated is 900 kgs and the capacity of the installed ‘Organic Waste Composter’ is 1000 kgs. To monitor and control the project performance, water meters are installed to Landscape water consumption, treated grey water Consumption and Domestic Water Consumption. In addition to the above, miscellaneous sustainable features were built in the project to achieve higher performance and consume less resources. This 720 apartment project spread over 1.5 million sq. ft. area with 9 iconic towers has received the Green Homes Platinum Certification from IGBC. Aparna Sarovar Grande is Aparna's FIRST "IGBC Green Homes" project and Platinum Rating Certification is attained in their very first attempt. This project has also achieved the feat of being the FIRST Platinum Rated Multi Dwelling Apartment under IGBC Green Homes v2.0 in Hyderabad and Telangana. The project performance pertinent to water efficiency has been taken to a higher level with 18 out of 18 points. Achieved 7 out of 10 points on overall energy performance with respect to IGBC Benchmark. This sustainable project has created new benchmarks for luxury housings projects and proved that "luxury and sustainability" can go hand in hand with optimization of natural resources. Conserve Consultants Pvt. Ltd. (CONSERVE) is a global consulting firm in the business of planning, design, development and maintenance of Energy Efficient, Sustainable, High Performance Green Buildings and Organizations. CONSERVE expertise lies in Certification(Green Building Rating Systems eg. LEED, IGBC, GRIHA etc.) and CertificationPlus(Design, Construction and Operations) of Built-Environment Projects. We also offer SustainabilityPlus services at organizational level.